As a horse owner you know what you need and what you would like in a home and property for your animals. Perhaps you run, or would like to start a training or breeding program or professional business. You may simply want a hobby farm or place to have your horses graze with room and the comfort of spacious and convenient stables, together with views for you overlooking the pastures. Whatever your intent, North Carolina provides a wide variety of locations, settings and communities sure to fit your equestrian interests as a horse owner. What drives more and more horse owners to the state is its rich equestrian history and the fact that it is ingrained into the lifestyle of North Carolinians to the north, south, east or west. Practically every county in the state has some form of equestrian activity. In addition, North Carolina is represented by all major breed of horse and can boast of national and international champions. It also supplies horses to countries abroad and maintains high breeding. The state’s horse industry is well situated for the future, as well, since it has the second largest 4H program in the country, training young people into responsible, caring horse owners. Perhaps you may simply be looking for a place for you and your family to own and enjoy horses. A hobby farm can be a great way to enjoy the equestrian lifestyle in a picturesque environment. There are many properties like this available in the state, with your own views of horses grazing on a few acres of land. Multiple stall barns, trailer accommodations, tack up areas, hay loft, space for an office and even covered porches are just a few of the amenities available on many of these properties. Perhaps you might be looking for a larger farm to use either personally or offer opportunities for others to discover as a side business. These locales are available and can include trails, riding arenas, or items such as run-in sheds that include water, electricity and fly mist systems and multiply fenced paddocks. Perimeter tracks for conditioning and gated entrances are but a few of the amenities available here, as well. If you are looking to start or expand your professional equestrian business, there are opportunities within the state, as well. 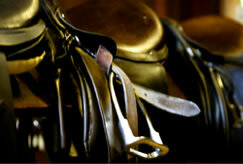 Breeding and training facilities abound with many features available to the professional equestrian. North Carolina has many equestrian communities to enjoy, also. 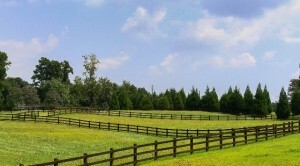 Equestrian communities can be typically either an equestrian center type area or more of a horse farm community. The equestrian center concept is simply having an equestrian center surrounded by individual homes who also share common areas like riding trails, barns and paddocks. The horse farm community concept is where individual horse farms are within a specific area, with private paddocks and barns maintained by the individual owner. 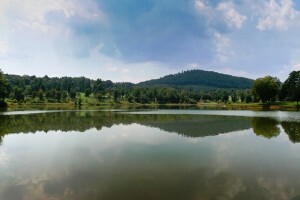 They may also have easements to private trails and some, like Derbyshire in Columbus, are private gated communities that include many different amenities. Features are plenty in a private equestrian community. To use Derbyshire as an example, it’s exclusive horse trails, riding arenas and community stable are but a few niceties that are part of the private community plan. For the horse owner, North Carolina presents a number of opportunities and options to enjoy your passion. Whether for pleasure, business or both you are sure to find what you are looking for in this part of the country.